Each school year, as part of our Youth Media Makers Project, we visit several high schools in Santa Fe, Albuquerque, Española, Los Alamos and Taos presenting a documentation of the previous year’s Festival and showing videos and animations created by professionals and local students. Last school year we visited 16 schools/24 classrooms/500 students. The goal is to expand the students artistic vocabulary and to encourage them to submit videos to be presented at our main exhibition venue. We presented 3 after school art/tech workshops in Hobbs, an oil town in southern New Mexico. Hannah Kramm, our educational coordinator, developed an exciting curriculum and engaged a wide range of five skilled new media artists to lead a two week program. 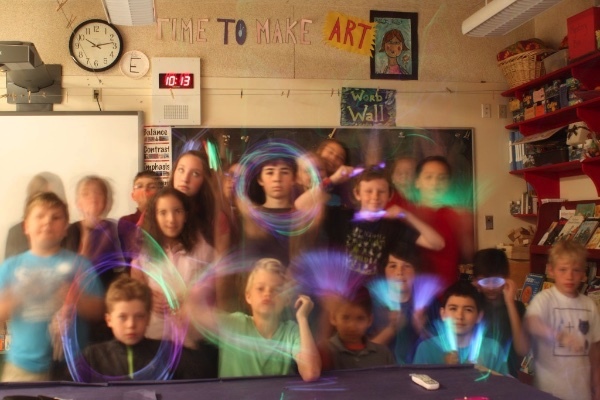 The Hobbs school system covered the costs of artists, equipment and supplies. The program worked with 60 children, developing manual, computational and creative skills in digital music and instrument production, robotics, poetry and coding, and 3D printing. Last June we gave 12 tours of the Festival’s main exhibition at El Museo Cultural to over 300 youth from the City’s Summer Camp Program, Boys and Girls Clubs and school summer programs. Each year we post an international call for interns. They are here for 1 month – through install, run of the festival and de-install. The interns gain hands on experience and have the chance to interact with media artists from around the world. We supply housing and a stipend. For our 2018 Festival we brought in 7 interns. In 2018 we are launched an intern program for local high school students, paying them Santa Fe’s generous minimum wage. For our 2018 Festival we had 8 interns.